The fantasy football waiver wire can often make or break your season. Making the right decision on which players to add and drop is crucial, so we have you set up with a deep list of potential waiver wire adds for Week 16. Nick Foles, PHI (3-5%) — Your waiver wire is probably picked over, but Foles is in play if you’re desperate. The Eagles are still in the playoff hunt, which helps Foles’ outlook. Damien Williams, KC (50-100%) — If he’s available, Williams is the top running back add of the week. Even is Spencer Ware returns, Williams will have value. 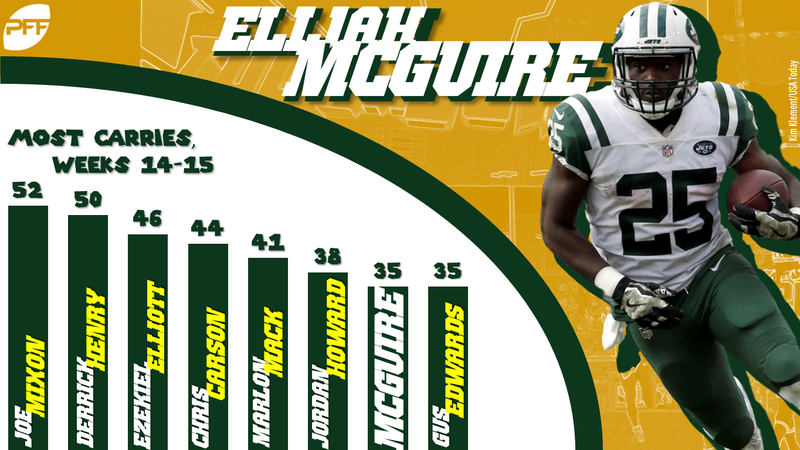 Elijah McGuire, NYJ (50-100%) — While he hasn’t been especially efficient on a per-carry basis, McGuire has had bell-cow status over the last two weeks with 35 carries and two rushing scores. Jamaal Williams, GB (50-100%) — Aaron Jones‘ injury opens the door for Williams to be an every-down back for the Packers this week. Mike Williams, LAC (50-100%) — Keenan Allen could miss time, which makes Williams this week’s top add at wideout. Robby Anderson, NYJ (50-100%) — Anderson is finally playing like the guy we thought he would be and is coming off a strong outing in Week 15. Dante Pettis, SF (25-50%) — Pettis has a tough matchup this week, but he’s worth an add. He’s the No. 5 fantasy wideout over the last three weeks. C.J. Uzomah, CIN (5-10%) — Tight end is brutal this week, but Uzomah is at least seeing consistent work in Cincinnati. Sam Darnold, NYJ (1-3%) — Darnold has shown a growing chemistry with Robby Anderson and offers some upside. John Kelly, LAR (15-30%) — With Todd Gurley dinged up, Kelly is a sneaky add this week. 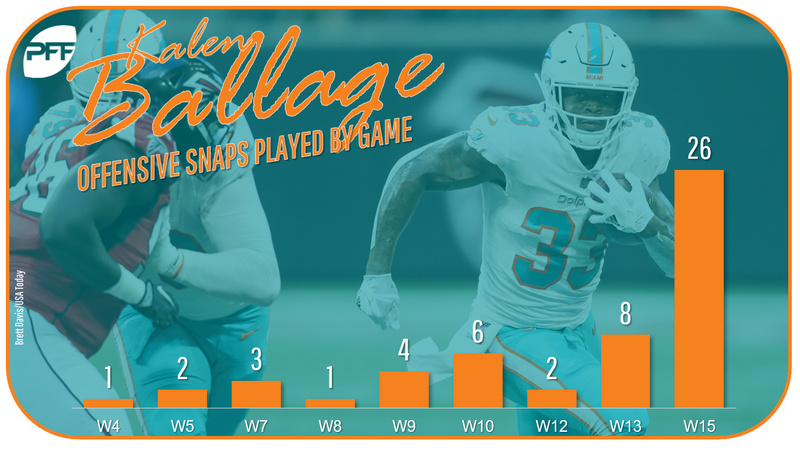 Kalen Ballage, MIA (5-10%) — Ballage exploded after Frank Gore‘s injury last week and is poised to see a decent workload in Week 16. Wendell Smallwood, PHI (5-10%) — With Josh Adams banged up, Smallwood found the end zone twice as a runner last week. DaeSean Hamilton, DEN (15-30%) — Hamilton yet again led the Broncos in receptions last week and should continue to be Case Keenum‘s top target. Josh Reynolds, LAR (15-30%) — While he didn’t score last week, Reynolds led all receivers with a massive four end-zone targets. Robert Foster, BUF (10-20%) — The rookie out of Alabama is surging down the stretch and has three 100-yard games over his last five. Tyrell Williams, LAC (10-20%) — Mike Williams is the preferred add, but Tyrell could see an uptick in usage as well if Keenan Allen is sidelined. Chris Herndon, NYJ (3-5%) — Herndon topped 50 yards last week and offers some desperation upside at tight end. Josh Johnson, WAS (1%) — He isn’t going to put up big numbers with his arm, but Johnson’s ability as a runner gives him a somewhat high ceiling this week. Alfred Blue, HOU (3-5%) — Lamar Miller is injured, so Blue could end up being the Texans’ lead back with a plus matchup on tap against the Eagles. D’Onta Foreman, HOU (1-3%) — Foreman should be active this week, but he’s only a desperation add. 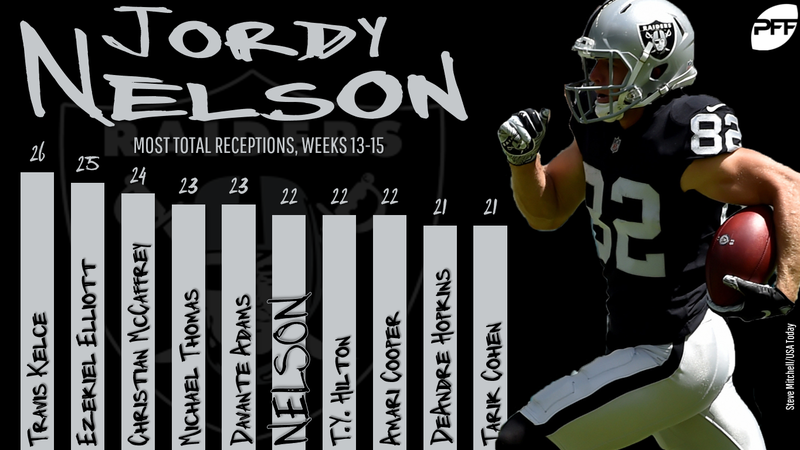 Jordy Nelson, OAK (3-5%) — The old man has been turning it on over the last three weeks with 22 catches over that span. Tim Patrick, DEN (1-3%) — Patrick has 12 catches over the last two weeks and is an intriguing Hail Mary option. Antonio Gates, LAC (1-3%) — Can the old man be your fantasy savior? Possibly. Gates had four catches for 54 yards last week. Tennessee Titans (1%) — Tennessee is rolling through the fantasy playoffs with double-digit fantasy points in each of their last two games. Better yet, they get to face a Josh Johnson-led Washington offense. Miami Dolphins (1%) — If there’s one thing we’ve learned down the stretch this season, it’s start your defenses against the Jaguars. Jacksonville has allowed 22 sacks and seven takeaways over their last five games. Cleveland Browns (1%) — If you have to dumpster dive this week, the Browns are worth a look. Remarkably, Cleveland is still in the playoff hunt, and they get to face Jeff Driskel at home.